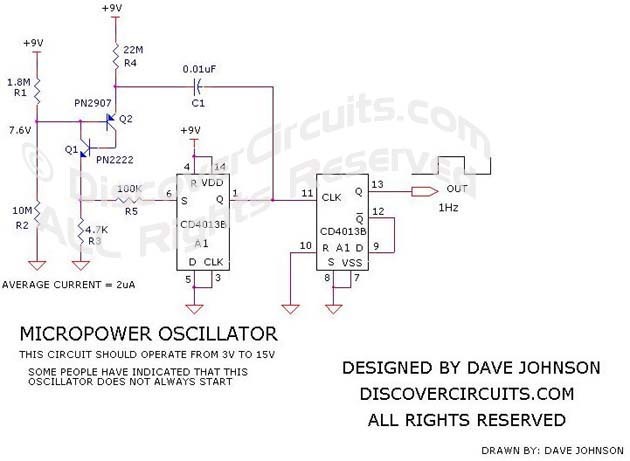 Circuit: #402- Ultra Low Current Oscillator #4 __ Circuit designed by David A. Johnson, P.E. The circuit below was inspired by a programmable unjunction transistor (PUJT) circuit sent to me by Karl Isbrecht. In Karl’s circuit, the unijunction circuit made click sounds in a speaker and consumed very little power. His circuit reminded me that a PUJT circuit could be made using a couple common transistors wired in a configuration like a SCR. In the circuit below, the output of the two transistor pulse generator is connected to a CD4013 dual flip/flop. One flip/flop is configured as a non-inverting buffer. The second is wired as conventional divide by two counter. The result is a nice low frequency square wave generator, which draws only 2ua from a 9v supply. The circuit will also work with a DC supply voltage ranging from 3v to 15v. The two transistor pulse generator circuit is biased to about the ¾ supply level. A high value resistor is used to charge up a small capacitor. When the capacitor reaches a voltage slightly above the bias voltage, the PNP transistor starts to conduct. Current from that part is fed to the base of the second NPN transistor. The collector of the second transistor is connected to the base of the PNP, so the second NPN transistor turns on the PNP transistor even harder. This current feedback causes the circuit to quickly snap into full conduction, which results in the discharge of the capacitor into the resistor R3. The voltage that appears at R3 is connected to the set input of the CD4013. With the configuration shown, the voltage at R3 produces a similar voltage at the Q output. The Q output is connected to the charging capacitor, so the capacitor is discharged and charged up slightly negative. The positive feedback aids in maintaining oscillation. The output of the first half of the CD4013 is connected to the other half. That side is configured as a classic divide by two counter. So, each pulse produced by the oscillator produces a state change in the flip/flop. With the component values shown, the circuit produces a very clear 1Hz square wave signal.